As we were staying at the Fonte de Medici within the Antinori estate in the Chianti Classico part of Toscana, it was only natural to visit his winemaking operation. Pierro Antinori was not available, so Barbara, the charming and knowledgeable head of the Antinori PR team, was our host and guide for some three hours around the vast estate. Our first stop was at Santa Christina, the stately country house, headquarter and winemaking facility of Antinori. 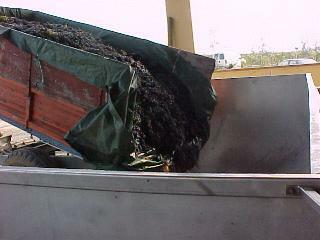 Picking was not over yet, so we had a chance of seeing grapes brought in and dumped into the de-stemmer. Inside the elegant tasting room we were treated to most of the range of Antinori's Tuscan wines (sorry, been lazy, no photos). 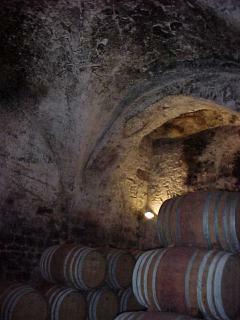 We tasted the wines at leisure while Barbara explained the background and composition of each wine. To help our taste buds (and stomach), tasty grissini paved way to pieces of bread dipped in Antinori's heavenly fresh olive oil. Peppoli, Chianti Classico - 90% Sangiovese, 10% Merlot. The simplest wine in the group. Young, expressively fruity but not much else compelling about it. 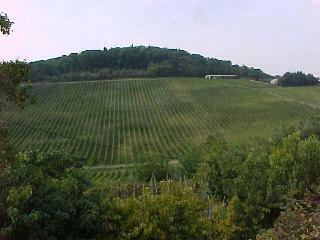 Villa Antinori, Chianti Classico Riserva - 90% Sangiovese, 10% complementary varietals. Deeper, more complex nose here. Good fruit with light wood tones. A bit tannic but very good. Tignanello - 80% Sangiovese, 15% Cabernet Sauvignon, 5% Cabernet Franc. The original 'Super Tuscan'. Pronounced red fruit and spices on the nose. Smooth, tasty with soft tannins. Full bodied but relatively accessible and forward for its age. Very fine. 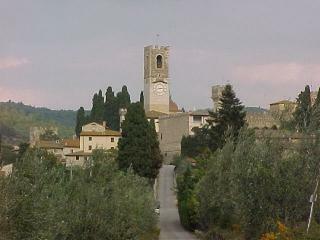 Badia a Passignano, Chianti Classico Riserva - 100% Sangiovese. 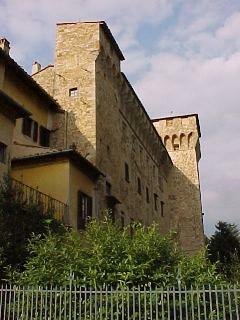 A modern 'classical' Chianti. Warm fruity nose with chocolate tones. Similar to the Tenute yet a touch softer and a bit more acidic. Serious, full bodied and much too young. Very fine. Tenute Marchese Antinori, Chianti Classico Riserva - 90% Sangiovese, 10% Cabernet and other varietals. Now this is a very serious wine. Red fruit and flowery notes on the nose. Deep, structured and mouth-filling on the palate. Full bodied, complex and very finely balanced. Extremely young at this point. Superb! Guado al Tasso - 60% Cabernet Sauvignon, 30% Merlot, 10% Syrah. This super-modern Super Tuscan wine was first produced in the 1990 vintage. 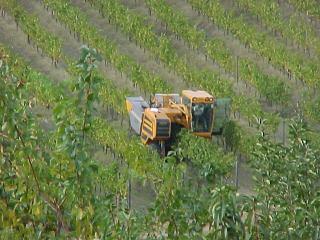 It is a single-vineyard wine that comes from the Tenuta Belvedere estate near Bolgheri in western Toscana. For me, this was the best of the lot. Plenty of complex fruit both on the nose and on the palate. Very deep, stylish, with broad-spectrum of flavors. Full bodied, excellent grip with very long finish. Ridiculously young of course. Superb to outstanding!! The Antinori wine shop outside the main structure is a fine and very reasonably priced source for all Antinori wines. The kind Barbara augmented our modest loot with some really fine bottles as a present.